This leader guide has been developed for ease of use, to simply "open and grow." 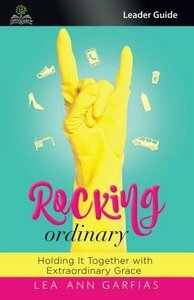 In Rocking Ordinary, Lea Ann Garfias comes alongside you like a true friend and shows you how an ordinary life can be lived with extraordinary influence. A gifted teacher and storyteller, she meets you exactly where you are in the everyday, messy, stressful, kids screaming, laundry piling, everyday life, and encourages you, loves you, and roots for you as you begin rocking your ordinary. About "Rocking Ordinary (Leader Guide)"